The instructions provided describe how to back up data from ArcGIS Online to a local machine as a preventative measure to save online content from being permanently deleted. The best practice to back up an organization's content on ArcGIS Online is to save individual copies of the data to a local machine. The following steps are only applicable with data owned by, or shared with, an organization or user. Any content deleted from an organization is permanently removed and cannot be recovered. 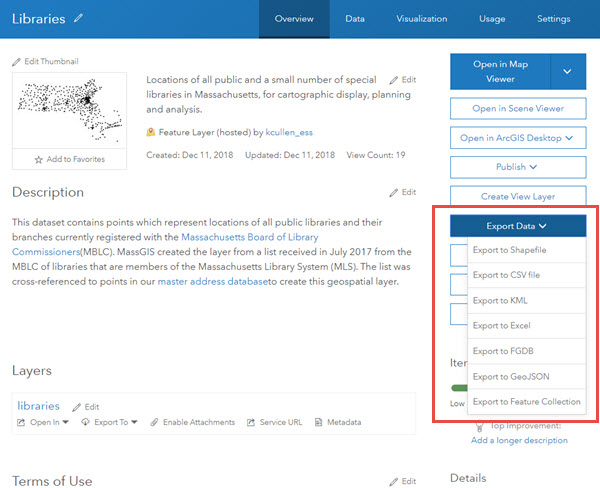 In ArcGIS Online, navigate to your Content page. Open the item details page for the data file and click the Download button. Open the item details for the hosted feature service. Click Export Data, choose the data format you want to export to. The file is saved as an item in your Content, To download the file navigate to the item in your content page and follow the download instructions above. FAQ: What are some best practices for data management when publishing feature services from ArcMap to ArcGIS Online? GeoNet: Can I download a complete backup of the ArcGIS Online Organization data?